The course is amazing as we teach you how to hear God’s voice and be confident that it is God. Because God speaks to our hearts, we will learn how to trust our hearts. Each lesson is to help us mature as Christian and learn who God is for us. Each student takes away the principles of the Word of God and can apply then to their lives. By activation we will teach you to hear that still small voice in your heart. Come study and learn with us who God wants to be for you. The course is offered in January and runs for 8 weeks. January 9th through March 5th. The class runs from 6:30 PM to 9:00 PM. 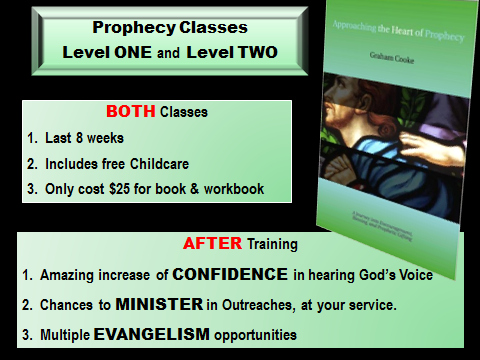 The cost is $25 which includes the text book “Approaching the Heart of Prophecy” by Graham Cooke, a workbook created by Liberty Church and babysitting. Graham has written many books and this book is part of a trilogy. You will have assignments each week to be finished before class. You will receive a completion certificate which will allow you to take Prophecy 2. In this course we will ask you develop your prophetic gift by a mentor who will help you write your prophecy and deliver the word. We call this Revelatory Prophecy. Each week you will pray for someone and write what you hear or sense, share it with your mentor, and be encouraged to develop the word further. You will be evaluated by your small group and will grade yourself as to its content and your presentation. At the end you will give your word and the recipient will share their responses and your accuracy. Please realize that the first time you attempt to move in the Spirit, you can’t be wrong but God loves it that you tried. The course is offered in January and runs for 8 weeks at the same time as Prophecy 1. January 9th through March 5th. The class runs from 6:30 PM to 9:00 PM. The cost is $25 which includes the text book “Prophecies & Responsibility” by Graham Cooke, a workbook created by Liberty Church and babysitting. This is the second book in Graham’s trilogy. You will have assignments each week to be finished before class. You will receive a completion certificate which will allow you to take Prophecy 3. The course is offered in April. April 10th through May 1st. The class runs from 6:30 PM to 9:00 PM.